bodies due to air pollution, highly processed food, cigarette smoke, or alcohol. Vitamin B group complex ensures an adequate level of vitality during the day and supports cardiovascular function. Due to high folic acid content, this is a perfect supplement for women who wish to become mothers. Due to environmental pollution, solar radiation, cigarette smoke, alcohol or other preserving substances contained in food, our bodies accumulate free radicals. Every day our body fights an unequal battle. 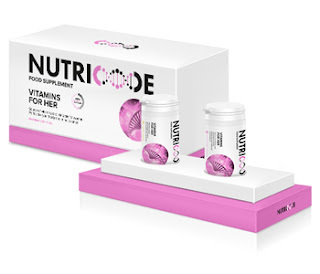 The NUTRICODE FOR HER dietary supplement is like divine ambrosia full of natural anti-oxidants. Vitamins A, C, and E protect the cells against oxidative stress and stimulate a strong immune system. It is a guarantee of good health and perfect well-being. Folic acid is one of the key building blocks of our bodies and we often suffer from its shortages. It is responsible for the cellular growth of our bodies and regulation of their functioning. The proper supply of folic acid is extremely important for women, especially future mothers. Its adequate level guarantees proper foetal development. Women need plenty of energy to keep up with the pace of everyday life. Each day brings new, exciting challenges but is also a considerable burden for the body. We know how much is on the mind of a contemporary woman. Inspired by their exceptional nature, we have developed a unique dietary supplement, which will be an invaluable support every day. VITAMINS FOR HER is a rich supply of the group B vitamins which support proper energy management within the body while maintaining an adequate sugar level throughout the day. This is a truly nutritive blend in just one tablet.